Max Richerson has owned his own barber shop on South Central Avenue for more than 50 years. Max Richerson has seen a lot in his 50-plus years of being a barber in the Campbellsville community. Max’s Barber Shop sits off South Central Avenue. 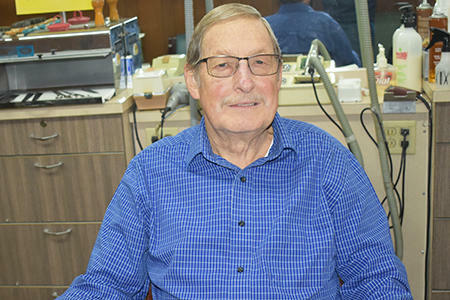 After opening the shop in Feb. 1968, Richerson said things have changed a lot in the community, but he still has a lot of love for his hometown, the place he has called home all his life. Even after going to barber school in Louisville, Richerson knew he would find his way back to his hometown. “I hadn’t really thought about it, but I always assumed I would come back,” Richerson said. He has seen many people come and go over the years, particularly people who lived near his shop. Richerson said there was a time when he knew of everyone that lived in the surrounding area, but that isn’t quite the case anymore. Although people have changed, many of the same businesses remain. For example, he cited Bear Safety and Harmon’s Furniture as two businesses that have been nearby the whole time he has been at his shop. Despite the changes, he said, it’s the people that keep him going, his loyal customers who have visited him for years. In fact, he said it was his love of people that got him into barbering to begin with, along with being able to see immediate results of his work. “I like to be able to see that I’ve done something. With my customers, I like to be able to help them look better, at least I hope they do,” he added, laughing. Over the years, people have come into the shop from multiple states, a fact Richerson always finds interesting when someone from another area comes in. To Richerson though, the people that walk through the door aren’t customers. They are family. Being in the business for so long has afforded Richerson some very rewarding opportunities. Among them is to see multiple generations of families coming into his shop. Reflecting on it, Richerson said he knows of multiple families that come in that have been his customers for three or four generations. He said it’s special to see children come in with their parents or grandparents, grow up, and then bring their own children back. He also has some of the same customers since he first started barbering in 1962, when he worked at a shop on North Central Avenue. It’s all part of that family atmosphere that Richerson promotes in his shop. Richerson said another rewarding part of his career was being able to cut each of his six grandchildren’s hair for the first time. Max Richerson is full of stories. Barber shops are always known as a place where people from all walks of life come in and share stories of all different kinds. “I could have written a book with all these stories throughout the years,” he said. Richerson has plenty of his own stories to share though, with his many experiences over the years. One of his most notable stories was when he cut hair on conjoined (or Siamese) twins. Conjoined twins are a rarity, with estimates stating that the phenomenon occurs in about 1 in 189,000 births. Nearly half are stillborn and another third pass away within 24 hours. Richerson said the twins were part of the Barnum and Bailey circus and he cut their hair a couple times when they were in Campbellsville. One of his customers, a Campbellsville resident, brought them in to get their hair cut. The twins actually lived out of state, according to Richerson. One particular day sticks in the mind of Richerson. He was alone in the shop with another man, cutting his hair. All of a sudden, the man went into cardiac arrest. Richerson said he dialed 911 and dispatchers coached him through CPR techniques until help could arrive. “I just did CPR the best I knew how, which wasn’t very much,” Richerson said. Paramedics were able to revive the man on the way to the hospital, and he survived the incident. Richerson said he still remembers that day very well. Reflecting back on his time serving the community through his barber shop, he said one big thing that has changed is the price of haircuts. When he started out, haircuts were $1, which held a lot more value then, he said. Now, they are $11. “Back then, that dollar would probably buy more than what $11 would buy today,” Richerson said. As he’s approaching 51 years of owning his own barber shop, Richerson is showing no signs of slowing down. He still opens up the shop three days a week, and while things sometimes get a little hectic, Richerson said he still enjoys barbering. In fact, he said he’s never really thought about doing anything else. Richerson also said he credits God for the health to continue working. As long as Richerson is standing behind the chair inside that little shop off South Central Avenue, he said he’ll keep continuing to make his shop a place where people not only come in for a haircut, but also for a warm conversation among friends.